Christopher Columbus, his crew and numerous microbes aboard the Santa Maria. Happy Columbus Day, a holiday celebrating Christopher Columbus’ arrival to the Americas on October 12 in 1492. Although Christopher Columbus was not necessarily the pinnacle of virtue in reality, Columbus’ image was molded into one symbolizing progress and the American spirit for a young United States of America in desperate need for their own heroes. - An excerpt from poem written in 1919 called "The History of the U.S." by Winifred Sackville Stoner Jr. But Columbus and his crew were not the only organisms that sailed the ocean blue back in 1492; microbes were certainly stowaways aboard the Nina, Pinta and Santa Maria. Although microbiology did not start to take center stage until Anton van Leeuwenhoek observed bacteria using a microscope he designed in 1676, we can use our modern understanding of microbes to examine historical events. Microbes played a huge role in the events surrounding Columbus’ life: Columbus’ mysterious illness leading to his death– and perhaps contributing to his insanity – and the introduction of syphilis into the Europe. While returning from his first voyage, historical records state Christopher Columbus suffered an attack from “the gout”. In the years following, Columbus was plagued by numerous aliments including fevers, bleeding from the eyes thought to be caused by influenza and recurrent episodes of gout. However, this diagnosis may have in fact been wrong. The historical clinicopathological conference (CPC) sponsored by the University of Maryland and Veterns Affairs (VA) Maryland Health Care System in Baltimore was held in 2005 to apply modern medical practices to revisit his diagnosis. Columbus was likely misdiagnosed with gout. The Gout by James Billray published in May of 1799. Also known as podagra when involving the big toe. Luckily, microbes do not actually look this menacing. Gout is characterized by painful swelling of joints caused by increased level of uric acid in the blood. This elevation in uric acid is often attributed to a lavish lifestyle full of excess consumption of alcohol and rich foods, resulting in gout historically being referred to as “rich man’s disease”. Gout flare-ups typically only last 7-10 days and resolve. However, the records show that Columbus’ situation may not fit this description of gout. For example, Columbus supposedly did not live a lavish lifestyle. His recurrent attacks of gout also resulted in Columbus being bedridden for months at a time. As a result, the CPC concluded that Columbus likely suffered from reactive arthritis, an autoimmune condition – an inappropriate response by the body’s immune system to attack the body’s own cells -- triggered by a nasty case of food poisoning. Syphilis is a sexually transmitted disease (STD) caused by Treponema pallidum, a spirochete bacterium characterized by their odd spiral-shaped cells. 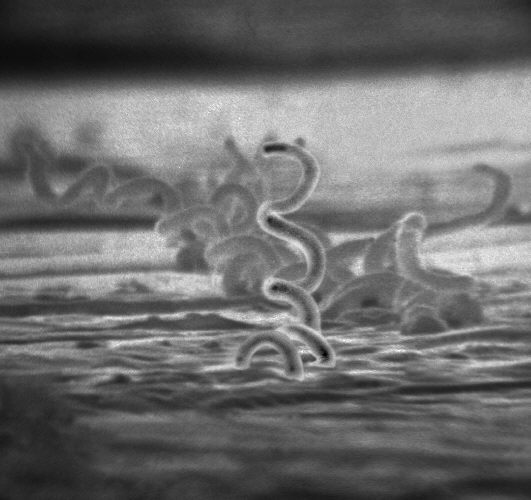 Syphilis evolved to become a sexually transmitted disease AFTER being introduced into Europe. Why? To survive the cooler temperatures and improved sanitary conditions of Europe at the time. With this new form of transmission, syphilis became one of the first global diseases and the origin of syphilis remains a hot topic of debate. Examining skeletal remains, researchers have found support that syphilis did not exist in Europe prior to Columbus’ voyage to the New World. These findings suggest someone traveling with Columbus may have brought the non-sexually transmitted version of Treponema back to Europe after the first voyage. Electron micrograph of Treponema pallidum on cotton-tail rabbit epithelium cells (Sf1Ep). Image credit – Center for Disease Control. Stay hungry and in the spirit of flu season and Columbus Day, stay sanitary!